The Kigali International Airport was so small that, even had I checked my backpack, it would've been no more than a few minutes before it appeared on the carousel for collection. On the other side of the airport, blue skies and white puffy clouds floated over the capital city. I was greeted by William, a representative of the Rwanda Development Board, who would be accompanying our group for the week. He had a bright smile, which made for a lasting first impression. We headed over to the LAICO Umubano Kigali Hotel to meet up with the rest of the group. We walked straight through the hotel lobby, and onto the back patio overlooking the pool. With little sense of shame (I swear it was the jetlag), I remember introducing myself to Peter by way of my intestinal challenges. I'm so glad he turned out to be a cool guy. It wasn't long before our SUV caravan of two was heading northwest toward the city of Ruhengeri, our jumping off point for the gorilla trek the following day. 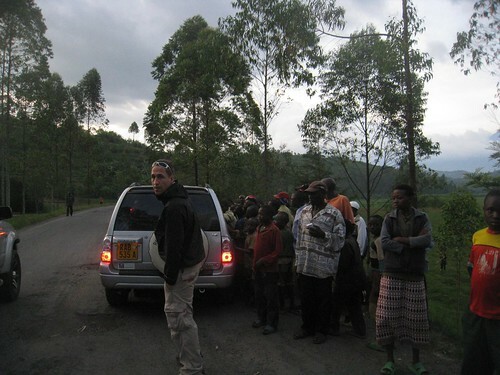 I was in the back seat of a Suzuki SUV with Stef; our driver, Robert, was kept company by Ben in the front seat. Everyone else was in a larger, more spacious Land Cruiser. 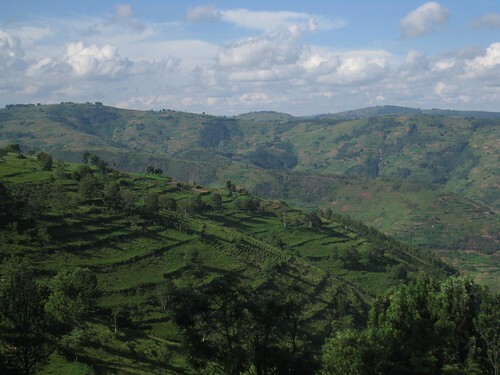 Rwanda is known as the “land of a thousand hills” and throughout our tour of the country, we would be following roads up, down, and around them. 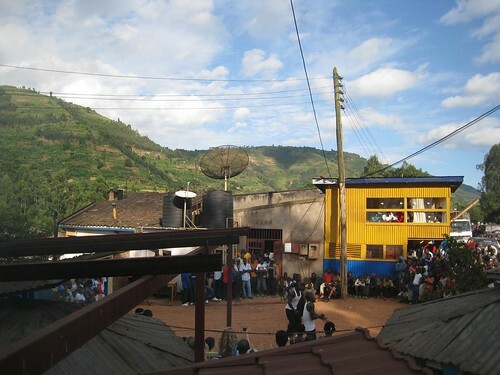 Even though it's only about a two hour drive from Kigali to Ruhengeri, we stopped for a bathroom break at a small town. A crowd was gathered, but I had to take care of business before I could investigate. 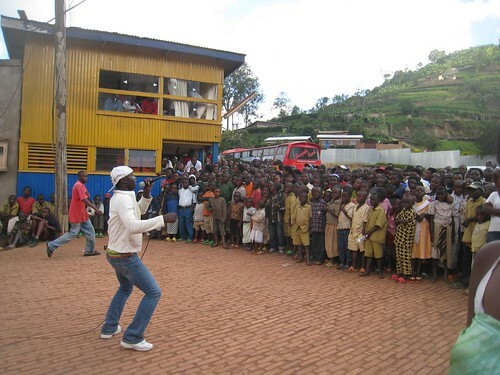 When I emerged from the depths of the restaurant's less than pleasant facilities, I saw the rest of our group watching a song and dance performance being put on by some young men. Their main audience was a group of 100 or more children who stood almost motionless. Along the sides and back of the courtyard were older kids and adults looking on as well. While we were there, four different guys performed. For all the planned activities on our tour of the country, it was the serendipitous moments such as this one which would often make the day's highlight reel. The afternoon was quickly passing us by, so we jumped in the SUV's and headed off yet again. It wasn't long before we came upon a soccer game in a wide green field. Eric, Peter, and Amanda's SUV had already pulled over to take photos, and they were all swarmed by kids. We stopped as well, and I jumped out to get some photos of the soccer game, only to find myself instantly surrounded by a circle 2-3 kids deep. Before I could figure out what was happening, an older man, possibly in his early 40's, was standing before me, his hand extended for mine. I shook it, and then he began to ask me questions in broken English. I patiently tried to answer his questions, all the while feeling slightly off by the close proximity of so many children. Clearly they meant no harm, yet I'd never been in such a situation and I found it a little overwhelming that my ability to move freely was so limited. Later, I referred to it as my first Michael Jackson moment. By dusk, we'd arrived at the Hotel Gorillas Volcanoes in Musanze. After enjoying a brief respite in my room, which was on the first floor, overlooking the pool, I joined the others in the restaurant. 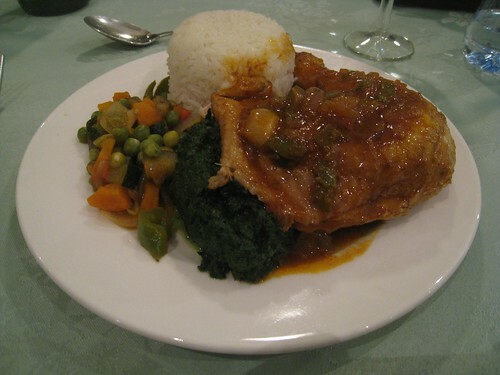 Dinner consisted of a surprisingly tasty vegetable soup, chicken, veggies, greens, and rice, with an array of fresh fruit for dessert. A trek to see endangered mountain gorillas, by far Rwanda's number one tourist attraction, awaited us at the crack of dawn. This is a very interesting article I love the lovely pictures of the place and the video of their community performance.